Micro-processor base 4 channel PID Controller with universal input (Same input type for all PID) with 4 individual display & individual PID parameter setting with 4 control relay output & 4 soft alarm display universal power supply & compact 96 x 96 x 110mm design, available with RS 485 or direct 18 coloum printer interface as option. 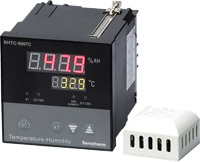 Micro-processor based Humidity + Temperature Controller with sensor unit having auto tune PID control for temp. & on / off control for refrigeration, dual set point hysterisis control for humidifier with password protection. RS 485 / miniprinter interface as optional. Sensor : PT-100 + Humidity with 1.2 mts.